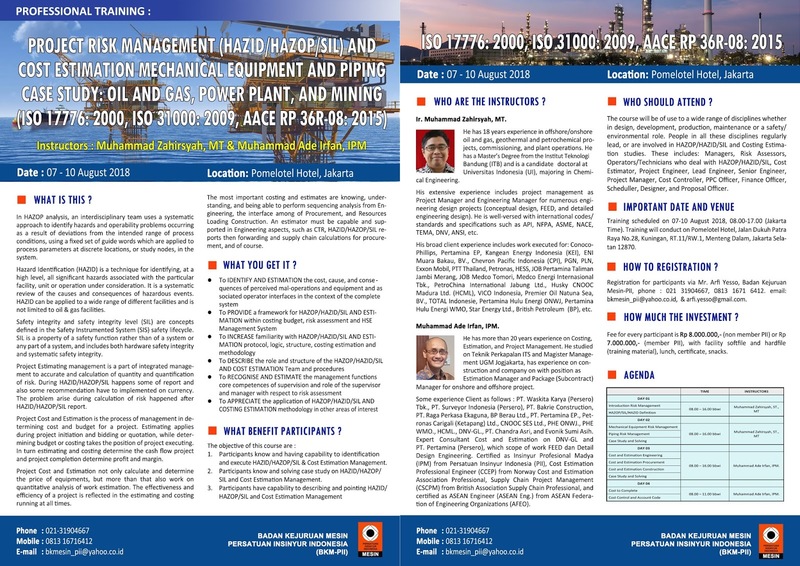 PROFESSIONAL TRAINING : PROJECT RISK MANAGEMENT (HAZID/HAZOP/SIL) AND COST ESTIMATION MECHANICAL EQUIPMENT AND PIPING CASE STUDY : OIL AND GAS, POWER PLANT, AND MINING (ISO 17776 : 2000, ISO 31000 : 2009, AACE RP 36R–08 : 2015). Project Estimating management is a part of integrated management to accurate and calculation of quantity and quantification of risk. During HAZID/HAZOP/SIL happens some of report and also some recommendation have to implemented on currency. The problem arise during calculation of risk happened after HAZID/HAZOP/SIL report. Project Cost and Estimation is the process of management in determining cost and budget for a project. Estimating applies during project initiation and bidding or quotation, while determining budget or costing takes the position of project executing. In turn estimating and costing determine the cash flow project and project completion determine profit and margin. Project Cost and Estimation not only calculate and determine the price of equipments, but more than that also work on quantitative analysis of work estimation. The effectiveness and efficiency of a project is reflected in the estimating and costing running at all times. 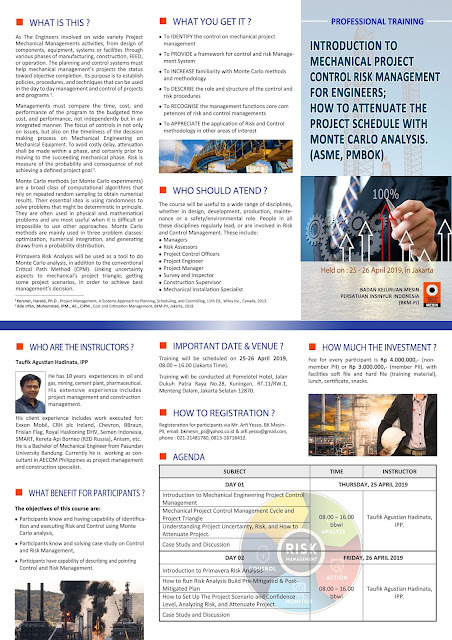 The most important costing and estimates are knowing, understanding, and being able to perform sequencing analysis from Engineering, the interface among of Procurement, and Resources Loading Construction. An estimator must be capable and supported in Engineering aspects, such as CTR, HAZID/HAZOP/SIL reports then forwarding and supply chain calculations for procurement, and of course. He has 18 years’ experience in offshore/ onshore oil and gas, geothermal and petrochemical projects, commissioning, and plant operations. He has a Master’s Degree from the Institut Teknologi Bandung (ITB) and is a candidate doctoral at Universitas Indonesia (UI), majoring in Chemical Engineering. His broad client experience includes work executed for: ConocoPhillips, Pertamina EP, Kangean Energy Indonesia (KEI), ENI Muara Bakau, BV., Chevron Pacific Indonesia (CPI), PGN, PLN, Exxon Mobil, PTT Thailand, Petronas, HESS, JOB Pertamina Talisman Jambi Merang, JOB Medco Tomori, Medco Energi Internasional Tbk., PetroChina International Jabung Ltd., Husky CNOOC Madura Ltd. (HCML), VICO Indonesia, Premier Oil Natuna Sea, BV., TOTAL Indonesie, Pertamina Hulu Energi ONWJ, Pertamina Hulu Energi WMO, Star Energy Ltd., British Petroleum (BP), etc. He has more than 20 years experience on Costing, Estimation, and Project Management. He studied on Teknik Perkapalan ITS and Magister Management UGM Jogjakarta, has experience on construction and company on with position as Estimation Manager and Package (Subcontract) Manager for onshore and offshore project. Some experience Client as follows : PT. Waskita Karya (Persero) Tbk., PT. Surveyor Indonesia (Persero), PT. Bakrie Construction, PT. Raga Perkasa Ekaguna, BP Berau Ltd., PT. Pertamina EP., Petronas Carigali (Ketapang) Ltd., CNOOC SES Ltd., PHE ONWJ., PHE WMO., HCML., DNV-GL., PT. Chandra Asri, and Evonik Sumi Asih. Expert Consultant Cost and Estimation on DNV-GL and PT. Pertamina (Persero), which scope of work FEED dan Detail Design Engineering. Certified as Insinyur Profesional Madya (IPM) from Persatuan Insinyur Indonesia (PII), Cost Estimation Professional Engineer (CCEP) from Norway Cost and Estimation Association Professional, Supply Chain Project Management (CSCPM) from British Association Supply Chain Professional, and certified as ASEAN Engineer (ASEAN Eng.) from ASEAN Federation of Engineering Organizations (AFEO). 3. Participants have capability to describing and pointing HAZID/HAZOP/SIL and Cost Estimation Management. 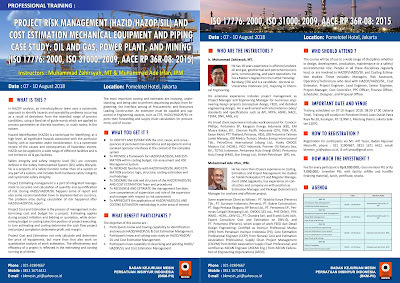 Training scheduled on 07 – 10 August 2018, 08.00 – 17.00 (Jakarta Time). Registeration for participants via Mr. Arfi Yesso, Badan Kejuruan Mesin – PII, email : bkmesin_pii@yahoo.co.id and arfi.yesso@gmail.com, phone : 021 31904667, 0813 1671 6412. Fee for every participant is Rp 8.000.000,- (non member PII) or Rp 7.000.000,- (member PII), with facility softfile and hardfile (training material), lunch, certificate, snacks.